One of my favorite things is vintage & antiques. It is so fun to shop for unique & one of a kind items. We don't have a lot of vintage shops for the deals so I'm excited to share a deal today from 5 gardenias - Kathi's shop is filled with so many fabulous vintage goods! - To redeem your voucher: Select the items you'd like purchase, proceed to checkout, and select "other" as your payment option. 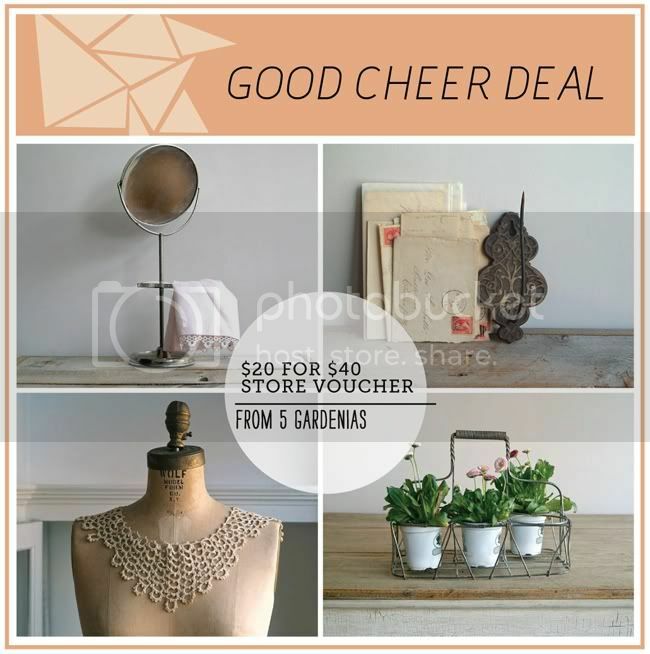 In the "Note to Seller" box, be sure to include this message: "I purchased a voucher at oh, hello friend Good Cheer Deals worth $40. My paypal address is (enter your paypal address here)" If you exceed the voucher amount, a Paypal invoice will be sent to you for the remaining amount. - Voucher can not be used toward shipping costs. - Voucher expires 3 month from purchase date.